For many years, escapism from the real world has been one of the main draws to people who play video games. In the world of a video game, the impossible can become a reality, letting you do things that could never happen in real life. Sunset Overdrive recognizes this fact and embraces it. This new open world shooter from Insomniac Games (best known as the creators of the Ratchet and Clank, Resistance, and Spyro franchises) lets you bounce off shrubs, hang from telephone wires, and shoot fireworks at robots. In short, it’s absolutely ridiculous in all the best ways. In Sunset Overdrive you begin as an ordinary guy or gal in Sunset City working a dead-end job for Fizzco, the giant corporation who runs just about everything in town. Fizzco hosts a party for the city, inviting everyone to try out their new energy drink, Overcharge Delirium XT, before it gets shipped worldwide. Unfortunately, everyone who drinks Overcharge turns into a raving mutant, and Fizzco cuts Sunset City off from the rest of the world in an attempt to hide its mistake and protect its pocketbook. For you, however, this crisis is your chance to shred the rulebook, dress how you want, and turn the city into a playground as you seek to expose Fizzco’s plans. 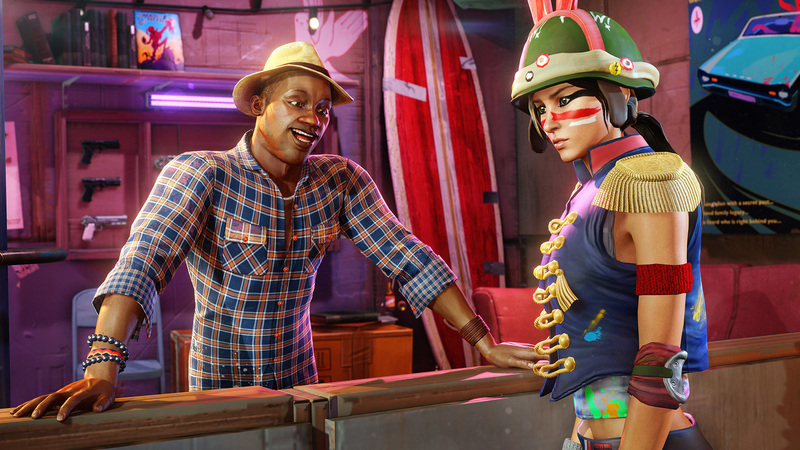 Humor unabashedly drives the storytelling in Sunset Overdrive. Your character routinely breaks the fourth wall as you interact with the game’s zany characters, who routinely send you off to perform menial, silly tasks to make them happy (such as retrieving a robotic dog for a preppy student who does nothing but text her friends all day). All these characters are fairly one-dimensional, but more often than not their sincerity in the middle of such ridiculous situations makes them rather endearing. Traversal in Sunset Overdrive is very reminiscent of the old Dreamcast title Jet Set Radio, and is easily the most enjoyable aspect of the game. Bouncing off cars and grinding along rails and powerlines are the quickest ways to get around town, and the transitions between all of the grinds, wall runs, bounces, and pole swings are fast and fluid. The game further encourages you to get off the ground via the Amp and Style systems; Amps are upgrades that can be applied to the main character and to your weapons, and as you fill up the Style Meter at the top of the screen, these Amps activate and add additional deadly effects to your actions. Some notable examples include an ammo Amp that stuns enemies and a character Amp that causes explosions when you bounce off cars and other objects. As you bounce and grind through Sunset City, you’ll find plenty of enemies just waiting to put an end to your fun. Mutants rely on their large numbers to swarm and overwhelm the player, while most human “Scabs” and Fizzco robots attack from a distance with guns or lasers. The wild and wacky weapons at your disposal are more than capable of handling what the game throws at you, though, from the explosive TNTeddy to the chilling Freeze Bomb. Different guns are more effective against different enemies, encouraging you to try out new weapons as you acquire them. 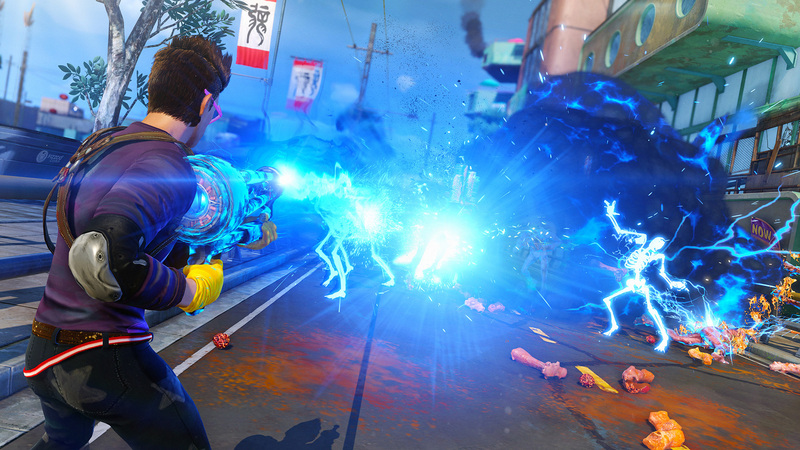 My only real disappointment with Sunset Overdrive lies in game’s the lack of difficulty. Once you learn to stay on grind rails or bouncing into the air, enemies rarely pose much of a threat, even during the game’s later missions. Bosses are just as silly and amusing as the rest of the game, but the ease with which they can be dispatched robs the player of the sense of accomplishment that should follow these climactic fights. In addition to the main story missions, the open world of Sunset City is filled with side quests and other activities. The friendly survivors have tasks for you to do beyond the main story missions, and there are a variety of smaller, timed challenges available throughout the city as well, such as smashing TVs in a back alley or delivering bombs to enemy bases. 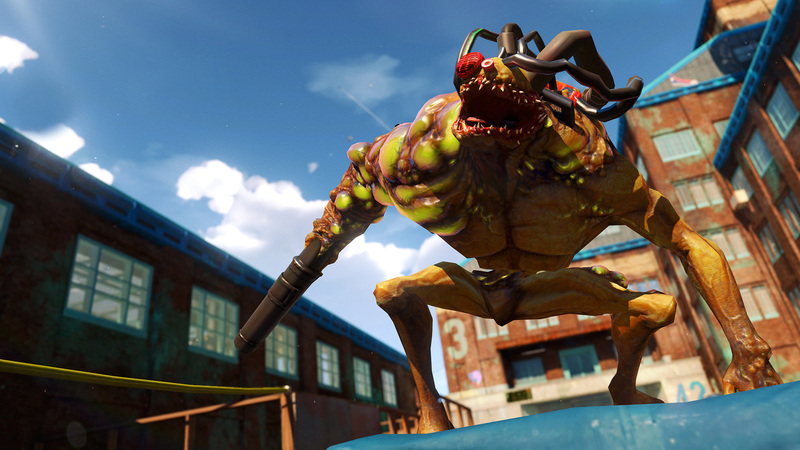 Sunset Overdrive’s cooperative multiplayer mode, called Chaos Squad, tasks a group of up to eight players to tackle several of these timed challenges in a row, culminating with a round of Night Defense, in which the team protects vats of Overcharge from thirsty mutants. Between the main missions and all of these optional activities, there is enough content in the game to keep you occupied for at least twenty hours. Sunset City bursts with color and absolutely oozes style. Bright blue skies smile upon you as you bounce and grind your way through the streets. Mutants explode into orange goo. The energetic rock soundtrack, which dynamically becomes louder and more complex as combat intensifies, complements the frenetic action on screen. All these sights and sounds reinforce the lighthearted tone of the game, and they fit well alongside the silly characters and blatantly unrealistic gameplay mechanics. Just as important as the appearance of the environment is the customization of your character. In addition to selecting your gender, body size, hair, and facial features, you can also choose from a wide variety of clothes, ranging from the relatively normal (like jeans and t-shirts) to the downright insane (like a pair of briefs with a kangaroo head on the crotch). All of these aspects of your character’s appearance can be changed at any time and slapped together into any combination you desire. As you progress through the game you gain access to plenty of additional clothes, either purchased with in-game currency or rewarded for completing quests, so there’s plenty of incentive to go back to your wardrobe from time to time and try out your new garb. 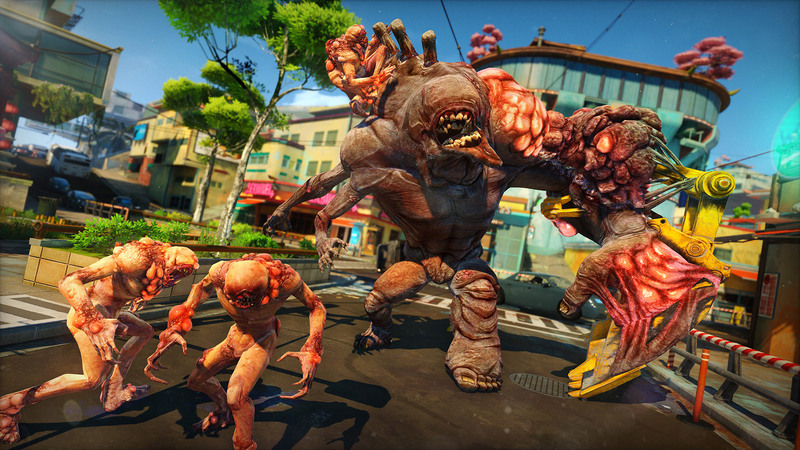 The bright, upbeat world of Sunset Overdrive invites you to hop in and just have fun. Nothing is meant to be taken seriously, and that’s a good thing, because it lets you do all sorts of crazy, awesome things that don’t make sense in real life, or even in most other video games. So go put on your best necktie and a pair of gym shorts; it’s time to blow up some bad guys and save Sunset City.